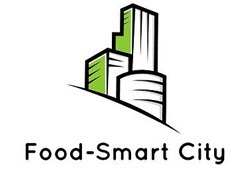 The Smart Food Cities project is a part of the European DEAR (Development education and awareness raising) programme, which is designed to raise public awareness about food security and sustainable development issues. Marseille is one of the 11 cities that have signed up to the initiative. “It is vital that we address all aspects of sustainable development and capitalise on the lessons learnt by other cities. What is more, Marseille offers expert potential on all issues concerning water, whose role in the food chain is self-evident.” The kick-off meeting for the programme will take place on 5-6 February 2016 at the Villa Valmer. Towards the end of March 2015 Marseille and Montpellier played host to the French week of the Lactimed programme, which is designed to strengthen the production and distribution of innovative dairy products in five production regions: Bekaa and Baalbek-Hermel (Lebanon), Bizerte and Beja (Tunisia), Sicily (Italy), Alex andria and Beheira (Egypt) and Thessaly (Greece). The ReaMed Forum, organised in Marseille, explored ways of leveraging research and innovation potential and promoting partnerships between innovative businesses in the Euro-Mediterranean region. With an overall budget of €4.8 million, Lactimed is 90% funded by the European Neighbourhood and Partnership Instrument (ENPI). The project, which is coordinated by the Anima Investment Network, began in late 2012 and will conclude in May 2015. What is required for the birth of a genuine Euro-Maghreb ICT sector? In the wake of an overview of ICT in Algeria, Morocco and Tunisia, which included a number of success stories and mapped out 14 avenues for development, the Institute of the Economical Prospective of the Mediterranean World has identified a number of levers to promote growth within the sector. The study points out that the Maghreb has all the human and technical prerequisites for the development of a digital sector. However, for this to occur, there must be developments in the areas of financing (fiscal laws that promote risk capital and business angels) innovation measures (supporting measures), mobility (interconnections between vocational and technical education), infrastructure, support for exports and greater public and private networking. In countries where unemployment is public enemy number one, it appears self-evident that an economy whose main aim is not maximising profit but contributing to the development of society as a whole, will be well received. In a multi-stakeholder study* funded by Femip, the FEMISE goes further still, asserting that the SSE “could become a much-needed tool for socio-economic innovation in the Mediterranean region.” The report offers an assessment of the current economic reality in the sector in three countries (Morocco, Tunisia and Egypt), both identifying obstacles and suggesting avenues for improvement. The sector suffers from a dearth of government support and access to funding. However while the contribution to GDP of the social and solidarity economic sector barely exceeds 1%, the number of direct jobs created is as high as 4%. 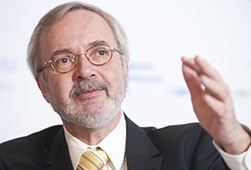 2014 has been as “an exceptional year” claimed Germany’s Werner Hoyer, President of the EIB, at the presentation of the European Investment Bank’s results in Brussels on 23rd February. The European financial arm lent €77 billion in Europe and the rest of the world last year. The targeted extra €180 billion to be produced by end of December will be achieved by late March, said Hoyer. The EIB invested €8.2 billion in France in the health, education, industry, transport and telecommunications infrastructure sectors. 16% of this was earmarked for SMEs. The EIB is currently working on implementing the European fund for strategic investment – the primary instrument of the Juncker plan, which should come into play in mid-2015. 400 teachers and researchers, political, institutional and financial representatives of the Mediterranean region came together on 12-13 February 2015 at the Villa Méditerranée in Marseille to explore the challenges and issues of scientific cooperation on either side of the Mediterranean. The key focus was the need for strengthening research and innovation in response to the issues of sustainable development in the Mediterranean. The two days revolved around four main themes: health, climate, social law and energy. 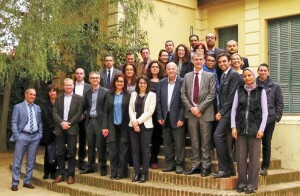 The meeting, which took place at the premises of the UfM Secretariat in ‎Barcelona, aimed at taking stock of the work performed so far and ‎discussing the way to move forward. Above all, it focused on developing ‎synergies, exchanging experiences and sharing best practices among the ‎local partners of the MedNC consortium. All the partners noted their responsibility in front of expectations generated by the program. 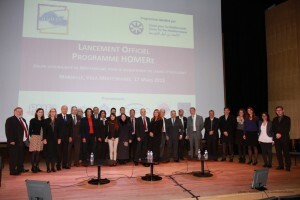 120 people were present on March 17th in Marseille for the official launch of the program HOMERe. About fifteen speakers, including Bernard Morel (Vice-président of Région Provence-Alpes-Côte d’Azur), Delphine Borione (Assistant general secretary of the Union for the Mediterranean), Louis Aloccio (Vice-président of ASCAME), and also Antoine-Tristan Mocilnikar (Inter ministerial delegation for the Mediterranean area), presented the program, its operations and the expected benefits. Company owner and trainee of the program also provide their experiences. HOMERe fulfils two objectives: the promotion of youth employment and the development of private sector in the region. By improving student access to international mobility and to the acquisition of skills in a professional environment, HOMERe contributes to increase their labour market opportunities, while also support the development of businesses, especially SMEs, in the Mediterranean. HOMERe is a citizen initiative in whom Mediterranean companies have a vested interest in taking an active role, for themselves, but also for the economic development and the collective well-being of the zone. Started by the Réseau Méditerranéen des Ecoles d’Ingénieurs et de Management (RMEI) and the French Foreign Trade Advisors, the project is promoted by the Office of Economic Cooperation for Mediterranean and Middle East (OCEMO) and Campus France and is labelled by the UfM Member States.